The recently published issue of the Albany Law Review opens with a dedication to Stewart F. Hancock, Jr., who served on the New York Court of Appeals, the state's highest court, and passed away earlier this year. The dedication to Judge Hancock includes a tribute by Judge Richard D. Simons, his dear friend and colleague on both the Court of Appeals and, previously, on the New York's Appellate Division, 4th Department. It is the eulogy Judge Simons delivered at the Memorial Service for Judge Hancock, on March 7, 2014, at the Park Central Presbyterian Church in Syracuse. TRIBUTE TO JUDGE STEWART F. HANCOCK, JR., by Richard D. Simons, HERE or HERE. The dedication also includes some reflections by John O‟Brien, a reporter with the Syracuse Post-Standard, who has covered the Court of Appeals and wrote about Judge Hancock for many years. THOUGHTS ON JUDGE HANCOCK, by John O’Brien, HERE or HERE. Finally, the dedication includes my own few words about the Judge. 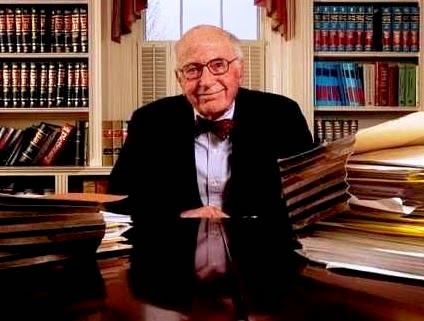 I was the beneficiary of several extraordinary years serving as the law clerk for this extraordinary man, and of many more years thereafter as his friend. FOREWORD: STEWART F. HANCOCK, JR., 1923–2014, by Vincent Martin Bonventre. HERE or HERE. [See also John O'Brien's report in Judge Hancock's hometown newspaper, the Syracuse Post-Standard, Stewart Hancock, former judge on state's highest court, dies at home in Cazenovia, HERE.